One of the most melancholy episodes in the ecology of the world occurred a hundred years on September 1st 1914 when the last passenger pigeon on Earth, called Martha, died in Cincinnati Zoo in the United States. Dozens of other species of bird have become extinct in recent decades – but what makes this story even more poignant was that the bird was the most numerous on the planet, with flocks in its native North America estimated at several billion just 50 years before the species vanished forever. Its demise is also unique in that the precise time of its extinction can be pin-pointed to within a few hours. In his passionate and highly informative talk on September 19th, Mark – a former Director of Conservation at the RSPB – told us how he had seen flocks of starlings on the Somerset Levels estimated at about a million. But these were nothing compared with the flocks of passenger pigeons which were so vast that they often took several hours to pass overhead and sometimes blocked out the sun for hours at a time. Simon Pokagon, who campaigned for Native American rights, wrote how he had seen the birds “fly in unbroken lines from the horizon, one line succeeding another from morning until night, moving their unbroken columns like an army of trained soldiers”. 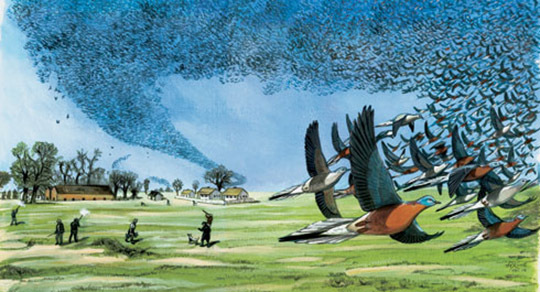 Mark told us the passenger pigeon had been a key part of the ecology of the north-eastern United States, but there were no legal restrictions on hunting them and so nesting colonies provided easy pickings, as long as people could find out where they were - and the expansion of the telegraph assisted this process. 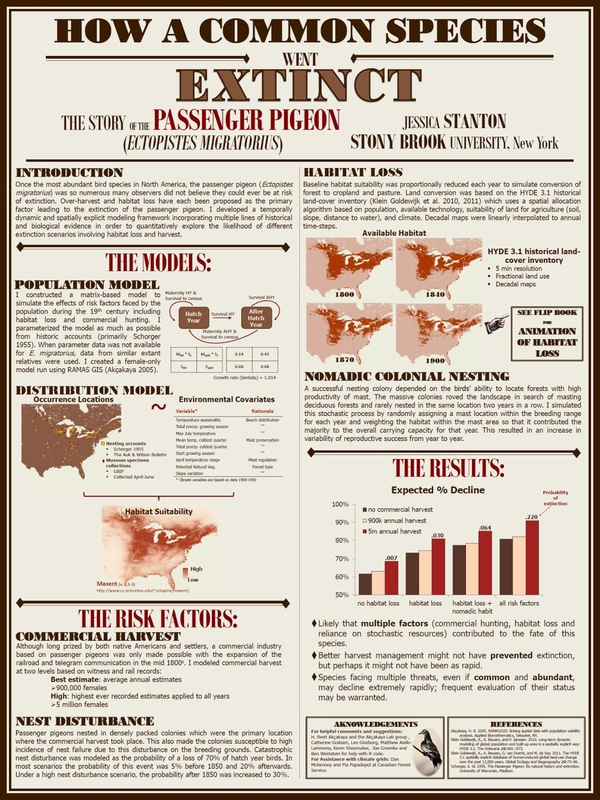 The growth of the railroad also opened up vast areas of the country as a market for cheap meat and the combination of increases in population, communication and transport allowed the supply of passenger pigeon meat to become an industry rather than a rural pursuit. An even more meaningful ingredient was the astonishing speed of the wholesale destruction of forests – which contained the birds' chief food source of beechnuts, chestnuts and oak acorns – and the ploughing up of the prairies. However, Mark posed the question of why did the last remaining passenger pigeons, maybe numbering 10,000, die out when there was little commercial hunting after 1885 and, indeed, laws were passed to protect the bird? 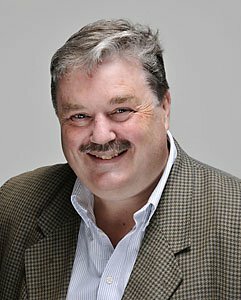 One explanation, he added, is that passenger pigeons simply “gave up” after their populations fell very low and life became tougher rather than easier, although a more plausible theory might be that the bird needed the stimulation of many others to get in the mood for mating and reproduction. 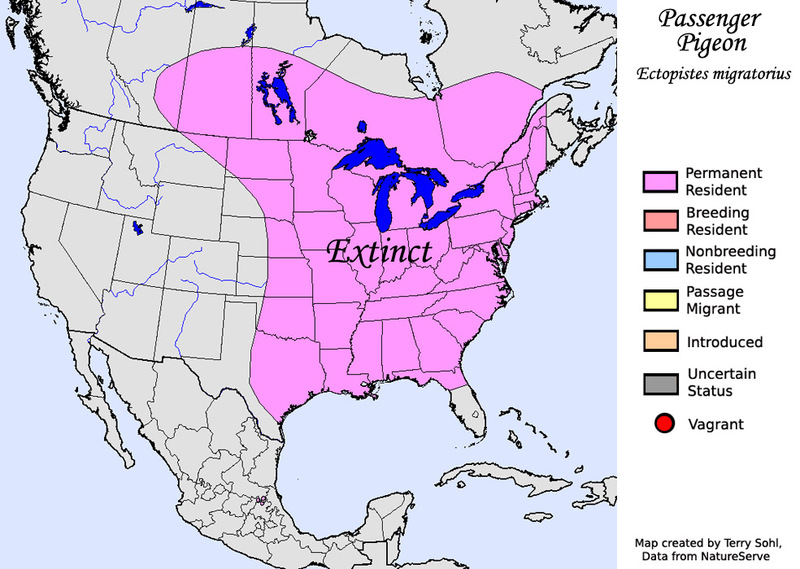 However, another negative factor was the huge increases in the human population, especially in Michigan and Wisconsin, where the passenger pigeon survived to breed last – and as the birds travelled to nest in diminishing numbers, they were shot out of the skies in increasing numbers. In addition, the passenger pigeon was a tasty dish for predators like the squirrels, jays and crows – and it was also attractive to goshawks and peregrines. The fragmentation of forest cover meant the bird was forced to nest in smaller colonies and to feed in smaller flocks – all of which lessened their ability to cope with a level of natural predation that it would have survived when numbered in billions Mark pointed out there are other examples of the mass slaughter of animals, such as the bison, which saw its numbers fall from several million in the US to just few thousand surviving in the wild – but controls have been put in place which should prevent its extinction. However, he told us the future is still far from certain for many species, including some in the UK, where Mark highlighted the rapid decline of the turtle dove on farmland close to his home in Northamptonshire. “Will this be another passenger pigeon and this time, will we care and will we save it?” he asked. However, he did highlight the more positive example of the Chatham Island Robin, which was reduced to a population of five, including one fertile female, but numbers are now over 200 after the intervention of the New Zealand Wildlife Service. At the end of his talk, Mark posed the question – did the extinction of the passenger pigeon matter when there are so many other species of bird, including pigeons? Of course he said, the answer is a resounding Yes! In his book - just published and called A Message from Martha – he points out the extinction is not only another depressing tale of human greed and stupidity, but it contains a vital message that it is imperative for humans to re-forge our relationship with the natural world on which we depend – and to plan a more sustainable future, otherwise other species could so easily go the same way as Martha. If the passenger pigeon still existed, albeit in smaller numbers, Mark said it would provide an unmatchable wildlife spectacle that Americans would be proud of – and tourists would enjoy. He suggested there might be a pigeon app for an iPhone and a Pigeon Watch website, rather like Tornado Watch. They would be mentioned in the same breath as the migration of wildebeest in the Serengeti and penguin colonies in Antarctica. Mark concluded by saying that he had recently seen the Giant Sequoia and the Blue Whale and was left enhanced by both experiences. 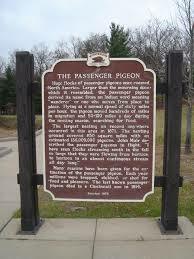 He said he valued such “signature species” - and the passenger pigeon would also have had the “Wow!” factor. He said that humans are diminished by its loss. He added: “Let us lift up our eyes to the skies and imagine an enormous flock of passenger pigeons and proclaim that the world would be a better place if there were still a real prospect of seeing them".